The final round arrived and due to weed problems the match was to be split between Stathe Drain (3 sections) and the River Parrett (2 sections). I went into the draw and actually managed to pick a couple of end pegs, A1 (and the scales for the team) for Andy and E8, on Stathe, for me. Elsewhere, Alan Dunn was also on the river, on B2 which left Les and Nicky both on Stathe. Got to my peg and it looked ok, although it was a long way over to the far bank (around 14.5 metres), I was quietly confident of a good result as the last time I drew this area two years ago I won the section with two bream and a tench. As per usual I set up a 0.4 gram rig with 0.12mm bottom to a size 18 B611 for across and a Drennan squatt rig with a strung out bulk, o.o8mm hooklength and size 20 B511 for down the middle (at around 9 metres). On the whistle I cupped some chopped worm and caster across and two balls of roach groundbait down the middle. Started across as the big fish tend to come early or late, was into some rudd and roach straight away, which isn’t normally a good sign, I gave it around half an hour, catching about ten fish before coming into 9 metres. Was only getting odd small fish and then Yeovil Nomads’ Jack Warner on the next peg latched into a good bream shortly followed by tench. This wasn’t going to plan!, I felt I had to go over again but could still only get smaller fish although I did manage a hand sized roach and a slightly better skimmer. By this stage, an hour and a half into the match the wind got up and I was really struggling to hold the pole at 14.5 metres. Back at 9 metres I was still only getting the odd small fish and was becoming very worried. I fed some more choppie across in the hope the wind might die down later in the match. In fact if anything it got worse and gusts were blowing the pole all over the place, even on my shorter line. With around half the match gone and around a pound and a half in the net I felt I had to put some fish in the net. Jack hadn’t added any more big fish and the Weston guy next to him didn’t seem to be doing a lot so I decided to get my head down and catch some small fish. With caster on the hook I was getting bites but either bumping or missing the majority of the bites. A change was needed so in a bid to try and stabilise the rig, I bulked the spread shot together and added a few inches to the depth. This worked to a certain extent although I was still bumping too many. Hooking the caster with the hook point showing I started to catch roach, skimmers and hybrids quite well. The wind by this stage was horrendous and I struggled my way to 86 fish, right near the end I dropped off a rudd of around 3oz (remember that fish!). The whistle went to signify the end of the match and I felt I hadn’t done the peg justice. In hindsight I wish I’d fished for bits from the start but the lure of the big fish proved too inviting. Walked up to weigh in and E1 put 6lb 1oz on the scales, followed by a 4lb+ weight and then a 6lb 2oz, the next peg put over 12lbs on the scales followed by Focus angler Steve Bishop with 7lb 6oz. I really thought I was going to be last in my section. The Weston guy weighed 3lb 15oz and Jack 10lb+, then it was my turn and as I pulled my net out there was quite a bit of splashing. They pulled the scales down to around 6lb, it was close, the chap on the scales called out 6lbs dead. This left me with 4 points (not good), but three more ounces would have been worth 6 points (remember that rudd!). Realistically if I’d fished for small fish all day third in section was achievable but hindsight is a wonderful thing. I knew our chance of overhauling Team Focus in the league stakes was gone but could we hold on to second spot as Yeovil Nomads were only four points behind and a blow out from us could allow them to sneak into second. When Les ambled down and said he’d had four points as well I feared the worst. The ever reliable Nicky was second in his section which comforted me slightly. It just remained to see how the two lads on the river had performed. Back at the Langport Arms for the results and Andy had 6 points and Alan another section second and 8 points which gave us a total of 30 points. On the day we were 4th, Team Focus and another team tied for 2nd on 32 points (remember that rudd!) and Yeovil Nomads were top dogs for the day with 36, but had they done enough? Firstly they read out the individual results for the league, Scott Russell from Focus won that with 52 points from a possible 54, a fantastic score, Nicky was 2nd (he won it last year) and Alan was joint 3rd. Then came the team results and when Yeovil Nomads were read out in 3rd position with 22 points I knew we were 2nd, our total league score of 21 meant we’d held on by 1 point! 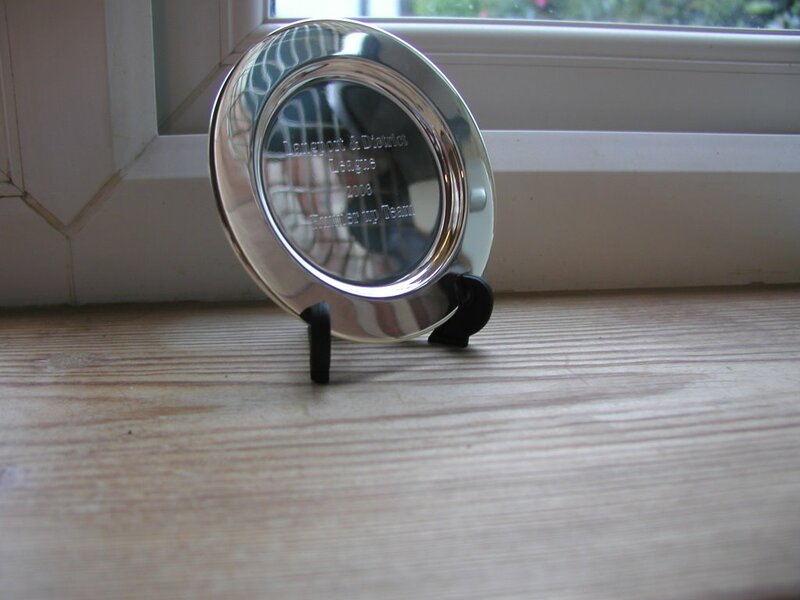 We each received an engraved plate (see picture) and a gift voucher for £5 from the league sponsers Yeovil and District Angling Centre. Yet another enjoyable league, in three years we have been runners up twice and knockout champions. Could we go one better next year? – watch this space.